The question is, can Camas County junior Katelyn Peterson single-handedly bring the Mushers a state team track trophy for the ride back to Fairfield on Saturday night? Stranger things have happened at the United Dairymen of Idaho's State Track and Field Championships to be held for the 94th time Friday and Saturday, May 20-21 at Boise's Bronco Stadium. Peterson, reigning State 1A triple jump queen at 35 feet, enters the two-day State 1A track meet with the top qualifying times in all four of her individual events—300-meter intermediate hurdles, high jump, long jump and triple jump. Winning all four is possible for Peterson, who could amass 40 points by doing so. Last year's State 1A girls' team champions from Liberty Charter only had 53 points, and fourth-place Raft River finished at 48. State trophies are given to the top four teams at state. Peterson isn't the only Northside Conference athlete to have a legitimate chance for the top six finishes which mean medals at Lyle Smith Field. The Carey Panthers are sending 13 athletes in 15 events to the state competition, and The Community School Cutthroats are sending their biggest-ever squad of four qualifying girls to only the third state track meet ever for Sun Valley. Besides Peterson and two of her teammates on the Mushers' girls' team, Camas County is sending five boys to state. All qualified for state during the 14-school 4th District 1A competition last Wednesday and Thursday at Jerome High School. Piling up eight gold medals, the Camas girls and boys placed second in the team standings, behind Hagerman (boys) and Raft River (girls). The Carey girls won three of the four relays to finish fifth in the team ranks, while the Carey boys used their depth to place third in the standings despite having only one gold medal, in the 4x200-meter relay. Seniors Jacy Baird and Joe Laidlaw, who each qualified in four events, lead Carey's boys. Besides the four Peterson golds at district, Camas also claimed golds from senior Bryan John by 10.4 seconds in the 3200-meter run, from Andrew Simon (high jump), Jordon Robles (shotput) and Carlos Robles (triple jump). The Community School had only sent two runners to state before, in 1985 when Pat Harper qualified in the 3200m run and last May when freshman Ellie Swanson made state in sprints. "When we went to state last year, Ellie said to me, 'wouldn't it be great to get a relay team here!'" coach and outgoing school headmaster Andy Jones-Wilkins recalled last week. Not only did Swanson provide the Sun Valley independent school with its first-ever district championship by winning the 400-meter run Thursday at Jerome, the speedy sophomore soccer star also qualified in 100m and 200m. And Swanson anchored the Cutthroat 4x400m relay team with a 1:02.00 final leg that gave Sun Valley second place behind Raft River—and with it a trip to the big arena of state. Her teammates were Hayley Rheinschild (1:06.00 first leg), Katie Feldman and Maranda Stopol. "The girls are on Cloud Nine," said Jones-Wilkins about the state-bound relayers. Other dominant athletes at district included Castleford senior Kale Weekes, who swept the sprints; Murtaugh junior Humberto Pacheco, who won both hurdles events; and Richfield's sturdy junior distance star Sasha Kent. All she did was win the 800m by 12.2 seconds, the 1600m by 28 seconds and the 3200m by 52.2 seconds. The schedule for the State 1A track and field meet has the field events starting Friday at 9 a.m. and continuing through the afternoon. Only the 1A long jumps will be contested Saturday morning at 8:30 a.m. In addition, the 3A/2A/1A 3200m finals are Friday at 9:30 a.m. (run in that sequence, girls then boys) followed by the 3A/2A/1A preliminaries Friday at 11:30 a.m. until 4 p.m. The 3A/2A/1A final running events are 10:30 a.m. Saturday. Teams: 1—Hagerman 122 points (19 sprints, 0 hurdles, 23 distances, 36 relays, 44 field). 2—Camas County of Fairfield 96 (0 sprints, 3 hurdles, 30 distances, 14 relays, 49 field). 3—Carey 84.5 (12 sprints, 15 hurdles, 0 distances, 26 relays, 31.5 field). 4—Castleford 84. 5—Raft River 56.5. 6—Oakley 48.5. 7—Lighthouse Christian 47. 8—Murtaugh 42. 9—Hansen 31.5. 10—Dietrich 25. 11—Glenns Ferry 22. 12—Shoshone 20. 13—Richfield 8. 14—North Valley 2. 100m: 1—Kale Weekes (Castle) 11.64. 3—Joe Laidlaw (C) 11.74. 200m: 1—Kale Weekes (Castle) 23.34. 400m: 1—Kale Weekes (Castle) 51.34. 3—Jacy Baird (C) 52.74. 800m: 1—Houston Horner (Castle) 2:08.24. 5—Davey Knowlton (CC) 2:12.74. 1600m: 1—Jacob Dalton (Diet) 4:50.94. 2—Bryan John (CC) 4:54.94. 3200m: 1—Bryan John (CC) 10:39.74. 2—Airik Donohoe (CC) 10:51.14. 110m high hurdles: 1—Humberto Pacheco (Murt) 16.34. 5—Shane Bingham (C) 18.04. 6—Dillon Cenarrusa (C) 18.14. 300m intermediate hurdles: 1—Humberto Pacheco (Murt) 41.74. 2—Joe Laidlaw (C) 42.24. 6—Carlos Robles (CC) 45.04. High jump: 1—Andrew Simon (CC) 5-10. 3—Jack Cenarrusa (C) 5-8. 5—Cody Lane (CC) 5-6. 6 (tie)—Charlie Rivera (C) 5-4. Long jump: 1—Zarek Tupper (Hager) 19-8.5. 2—Jacy Baird (C) 19-8. 5—Luis Garcia (C) 19-0.5. 6—Charlie Rivera (C) 18-6.5. 7—Brandyn Williams (CC) 18-5.5. Triple jump: 1—Carlos Robles (CC) 40-7.25. 4—Charlie Rivera (C) 40-0.5. 6—Brandyn Williams (CC) 37-10.5. 7—Colton Rasmussen (CC) 37-9.25. Shotput: 1—Jordon Robles (CC) 44-7. Discus: 1—Josh Carpenter (GlFerry) 142-5. 2—Jordon Robles (CC) 141-4. 6—Blair Peck (C) 120-3. 4x100m relay: 1—Hagerman 45.74. 5—Carey (Tori Alvarez, Lynn Mecham, Luis Garcia, Christian Zarate) 47.44. 7—Camas County (Andrew Simon, George Simon, Carlos Robles, Brandyn Williams) 47.84. 4x200m relay: 1—Carey (Jack Cenarrusa, Lynn Mecham, Joe Laidlaw, Jacy Baird) 1:34.04. Sprint medley relay (200, 200, 400, 800): 1—Castleford 3:50.14. 3—Camas County (Andrew Simon, George Simon, Cody Lane, Davey Knowlton) 3:59.34. 5—Carey (Christian Zarate, Lynn Mecham, Shane Bingham, Caleb Cenarrusa) 4:11.24. 4x400m relay: 1—Hagerman 3:36.04. 2—Carey (Shane Bingham, Jack Cenarrusa, Jacy Baird, Joe Laidlaw) 3:37.24. 3—Camas County (Andrew Simon, Davey Knowlton, Cody Lane, Davey Knowlton) 3:40.24. Teams: 1—Raft River of Malta 90 points (8 sprints, 24 hurdles, 9 distances, 21 relays, 28 field). 2—Camas County 86 (5 sprints, 17 hurdles, 0 distances, 10 relays, 54 field). 3—Oakley 78. 4—Castleford 77. 5—Carey 72 (7 sprints, 0 hurdles, 18 distances, 36 relays, 11 field). 6—Richfield 64. 7—The Community School 44 (23 sprints, 0 hurdles, 9 distances, 12 relays, 0 field). 8—Glenns Ferry 42. 9—Shoshone 37. 10—Bliss 33. 11—Hagerman 26. 12—Hansen 19. 13—Dietrich 13. 14—Murtaugh 4. 100m: 1—Xantha Darrow (Castle) 13.44. 4—Ellie Swanson (CommSchool) 13.74. 6—Daphne Kirkland (C) 14.04. 8—Larissa Stewart (CC) 14.24. 200m: 1—Xantha Darrow (Castle) 28.04. 2—Ellie Swanson (CommSchool) 28.14. 7—Arriana Nielson (C) 29.94. 400m: 1—Ellie Swanson (CommSchool) 1:02.04. 5—Larissa Stewart (CC) 1:10.44. 7—Micaela Adamson (C) 1:12.24. 800m: 1—Sasha Kent (Rich) 2:25.54. 3—Jaide Parke (C) 2:39.34. 4—Maranda Stopol (CommSchool) 2:39.44. 1600m: 1—Sasha Kent (Rich) 5:33.74. 3—Jaide Parke (C) 6:01.84. 3200m: 1—Sasha Kent (Rich) 11:55.54. 3—Jaide Parke (C) 12:51.14. 5—Maranda Stopol (CommSchool) 14:03.24. 100m high hurdles: 1—Addie Bedke (Oak) 16.84. 8—Carlie Strom (CC) 18.24. 300m intermediate hurdles: 1—Katelyn Peterson (CC) 48.64. 5—Carlie Strom (CC) 52.24. 7—Brittani Hulme (CC) 54.34. High jump: 1—Katelyn Peterson (CC) 5-4. 5—Brittani Hulme (CC) 4-6. Long jump: 1—Katelyn Peterson (CC) 16-9.5. 8—Stephanie Moore (CC) 14-5.25. Triple jump: 1—Katelyn Peterson (CC) 35-11.25. 2—Micaela Adamson (C) 33-8.25. 3—Stephanie Moore (CC) 32-9. Shotput: 1—Kassie Ottley (RR) 33-5. 5—Jessica Lanier (CC) 30-10.5. Discus: 1—Keegan Cenarrusa (Rich) 107-10. 100-5. 4—Jessica Lanier (CC) 94-5. 6—Lorene Andrews (C) 92-0.5. 4x100m relay: 1—Carey (Daphne Kirkland, McKayla Mecham, Arriana Nielson, Angelica Zarate) 54.24. 5—Camas County (Brittani Hulme, Stephanie Moore, Carlie Strom, Larissa Stewart) 56.64. 4x200m relay: 1—Carey (Angelica Zarate, McKayla Mecham, Lilly Rivera, Micaela Adamson) 1:53.74. 4—Camas County (Stephanie Moore, Sierra Sabin, Brittani Hulme, Larissa Stewart) 2:02.14. Sprint medley relay (100, 100, 200, 400): 1—Carey (Angelica Zarate, Lilly Rivera, McKayla Mecham, Micaela Adamson) 1:58.44. 5—Community School (Maranda Stopol, Hayley Rheinschild, Emma Wilander, Morgan Roudabush) 2:11.14. 4x400m relay: 1—Raft River 4:26.14. 2—Community School (Hayley Rheinschild, Katie Feldman, Maranda Stopol, Ellie Swanson) 4:37.64. 3—Carey (Erika Zarate, Angelica Zarate, Lilly Rivera, McKayla Mecham) 4:40.74. 8—Camas County (Geovanna Gonzalez, Taylor Gorringe, Sierra Sabin, Jamie Wise) 5:55.34. State notes—The Carey boys boast the top seeding time in the 4x200m relay and the 2nd-best time in the 4x400m; and Joe Laidlaw has the 2nd-best time in the 300m intermediates. State notes—Jaide Parke has the 6th-fastest seeding time in the 3200m; the Carey girls have the 2nd-best times in the medley relay and 4x100m relay, and the 3rd-best in the 4x200m relay. State notes—Ellie Swanson has the 2nd-fastest seeding time in 400m. State notes—Jordon Robles has the 3rd-best throws in shotput and discus; Bryan John boasts the 3rd-fastest seeding time in the 3200m; Andrew Simon has the 5th-best high jump and Carlos Robles the 5th-best triple jump. Katelyn Peterson (junior) 300m intermediate hurdles, high jump, long jump, triple jump. She is the defending State 1A triple jump champion. State notes—Katelyn Peterson has the top seeding time in the intermediate hurdles and best qualifying jumps in high jump, long jump and triple jump. 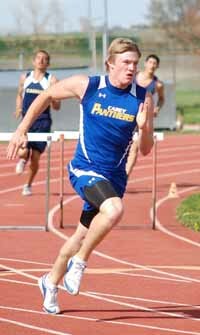 Four Carey School athletes and four from Camas County of Fairfield have been named to the 2011 Northside Conference All-Conference boys' and girls' track and field teams. Sprints (100m, 200m, 400m): Katelyn Peterson of Camas; Jacy Baird of Carey; Kale Weekes and Xanthra Darrow of Castleford. Hurdles (100m/110m and 300m): Katelyn Peterson and Carlie Strom of Camas; Joe Laidlaw of Carey; Moriah Dill of Dietrich; and Humberto Pacheco of Murtaugh. Distances (800m, 1600m, 3200m): Bryan John of Camas; Sasha Kent of Richfield; Abby Burk of Bliss; and Houston Horner of Castleford. Jumps (high, long, triple): Katelyn Peterson and Carlos Robles of Camas; Micaela Adamson of Carey; and Eli Berndt of Lighthouse Christian Academy. Field (shot, discus): Blair Peck of Carey; Keegan Cenarrusa of Richfield; Zach Fry and Kendra Flores of Castleford.